I am relatively new to Avaya products, so I could be missing something basic. I want to export a list of all extensions from the system. 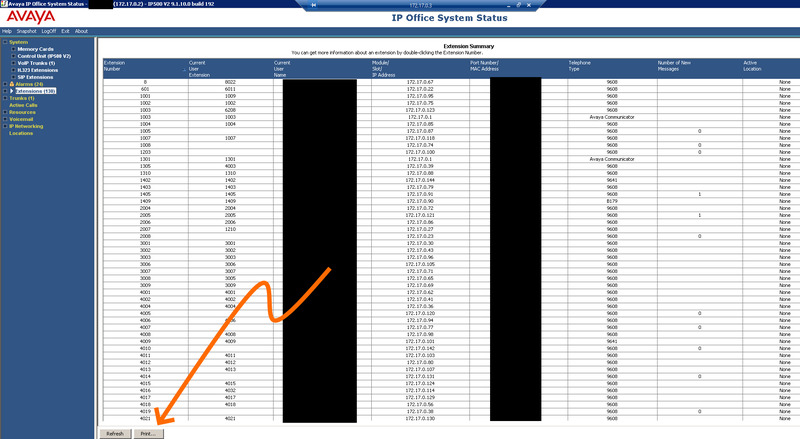 When I login to the IP Office System, I can go to "Extensions" on the left side. Now, at the bottom I have a "Print" button. I can print this list of extensions as a PDF (or directly to a printer). Is there a way I can get a csv (or tab-delimited, or fixed-width) export of all extensions plus their names? I am not a IP office tech so I am not familiar but if you can ASA you can list stations then right click on the list and export to a .csv file that can then be sorted and reformatted any way you want. What version of IP Office are you running? Partner, Basic, Essential, Preferred, Server? In what program do you see a "Print" button? Manager? System Status? Web Manager? Use the Manager program to pull the configuration from the IO Office, then click on File > Import/Export > Export... click on User, change the Save In box to your desktop (or somewhere easy to find the exported file) and then go find the User.csv file and open in Excel. Here's your list of extension numbers and names. The "editions" question, I don't know how to answer. I opened IP Office, yet I can't find anywhere the "edition" (Partner, Basic, Essential, Preferred, or Server). Where could I find that information? I log in to the System Status program. Once logged in, on the left-side tree, I click on "Extensions". That brings up a big table with Extension Number, User extension, Name, IP Address, MAC, etc. I'm going to try your File -- Export process now. The Export process to csv worked super. I now have the data I can massage and get to the list the user's want. On that Extensions view in System Status, click on any extension to highlight it. Press Control-a to highlight them all. Control-c to copy to your clipboard. Oh, and from the view, you are not in Basic or Partner mode. Go to Voicemail, if you see Embedded you are using Essential (aka Standard) mode, Voicemail Pro indicates Preferred edition. Last edited by thiel2; 04-01-2019 at 02:58 PM. More tools for the toolbox! Finally I know what I have.